Want to know how to use the winter months to learn a new skill, or ever wondered which glider finish to choose? You can find the answers in the February-March issue of S&G, published on 25 January, where you can also read about a world record triangle and a 2000km diploma flight. Winter flying doesn’t have to be dull. Why not keep yourself current by trying a new skill? At Booker GC, members have been learning about formation flying and dual towing. It is hard to hold formation – and it’s certainly not something to be tried without expert guidance – but it can be a lot of fun and very rewarding. Our cover pic shows a dual tow during one of the flights in which the challenge was to maintain the formation from the dual tow to landing. When, as Hus Bos technical officer, Basil Fairston found himself with samples of the three most popular glider finishes and a length of Libelle wingtip from a glider that had come to a sticky end, it was time to carry out an experiment he had wanted to do for a long time. Basil sprayed a sample of each finish on to the wingtip, wired it onto the roof of the club’s Portakabin and then left itexposed to the elements for seven years before examining the results. With snow covering much of the country, the prospect of flying in Argentina was appealing. However, the expected day after day great Andean wave systems just didn’t materialise and you had to be ready to take the few options that came. With the weather looking good for Christmas Day, Bruce Cooper and John Williams took advantage of flying conditions with a resulting world record triangle and 2,000km diploma flight. Chris Nicholas’ LAK 17A will be the first in the UK to be fitted with a Front Electric Sustainer (FES). In the first of a two-part feature, Chris explains the thinking behind his decision. Having taken the glider to Slovenia last November, Chris is now eagerly awaiting its return and looking forward to a rejuvenation of his flying. Also in this issue: BGA Chief Executive Pete Stratten reports on actions being taken to improve airspace safety and looks at the part we, as individuals, can play in this. BGA Chairman Patrick Naegeli congratulates Keith Mansell on a well-deserved MBE and comments on the challenges facing us in 2011. Alison Randle and Mike Fox explore ways to combat high membership turnover. 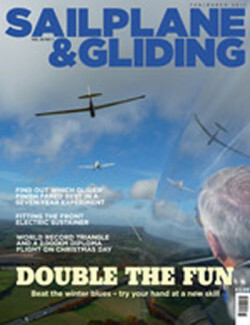 Peter Smith reports how Devon & Somerset GC helped film gliders and pterosaurs flying together – with David Attenborough in the glider. Steve Longland concludes his excellent series on aircraft instruments with a look at total energy compensation. A field landing accident prompts Andy Balkwill to ask when you last had a field landing refresher. We’ve a report from the late Jochen Ewald on Idaflieg 2010. Diana King and Keith Auchterlonie discover what difference heated clothing can make. Martin Simons tells a story of the one occasion in 60 years of flying where he has been truly frightened. Paul Ruskin explores how to get today’sNOTAMs onto a PDA. How Walking on Air got Leslie Barr and Maria Duncan hooked on gliding. VGC secretary Bruce Stephenson introduces a regular look at the world of vintage gliding. Jockey/pilot Jane Cooper reveals how Welland GC raised the profile of gliding at the Burghley Horse Trials. Mike Jefferyes reports on the 2010 Inter-club League finals. And, of course, we’ve more truly stunning images in the Gallery pages. What can we do to combat churn?